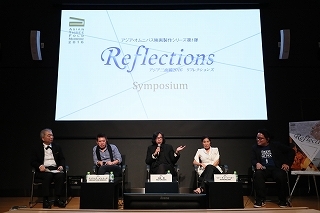 Three acclaimed directors from different parts of Asia have been brought together for the omnibus film Asian Three-Fold Mirror 2016: Reflections, the first of a series of co-productions between the Tokyo International Film Festival and the Japan Foundation Asia Center, in an annual project that will continue up to the Tokyo Olympics and Paralympics in 2020. The project aims to reflect on the history and culture of Japan and its Southeast Asian neighbors Cambodia, Malaysia and the Philippines. While it provides its filmmakers with basic conditions, there is plenty of room for them to exhibit a specific style and approach to living, working, or loving as a foreigner in Asia. 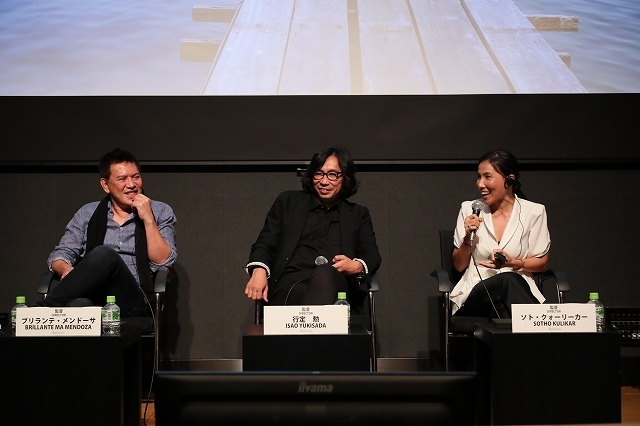 Brillante Ma Mendoza of the Philippines, Japan’s Isao Yukisada and Cambodia’s Sotho Kulikar gathered at a symposium with lead producer Takeo Hisamatsu on October 27, to discuss the challenges they faced filming in new territories and across borders. After being deported from Obihiro, Hokkaido, Manny (legendary actor Lou Veloso) returns to his native Philippines for the first time in 30 years, where he comes to the disturbing realization that his fate mirrors that of race horses past their prime and no longer of any use. Mendoza’s film effectively contrasts the stark Hokkaido winter with the tropic swelter of Manila, showing both as ultimately unwelcoming places for our isolated protagonist. Yukisada’s Pigeon is set in Penang, Malaysia, which is home to many Japanese retirees. The director discussed making the film to honor the memory of his grandfather, whose brothers died in a naval battle off the Malaysian coast during the Pacific War. The character of Yasmin (Sharifah Amani), a young Malaysian woman who takes care of the film’s senile protagonist (veteran actor Masahiko Tsugawa), is an homage to the late Malaysian director Yasmin Ahmad, as was the casting of Amani, who was discovered by Ahmad. Most of the drama of Yukisada’s film takes place mostly in an interior lodge, but occasionally steps out to traverse the sights of Penang – its alleys, backstreets, night cafes, and a beach which contains memories of the war past. The film is set in different timeframes — the bloody civil war period of the early 1970s, and the more stable post-Khmer Rouge 1994 — and concerns a romance between a Japanese man (Masaya Kato) who helps to build the bridge, and a Cambodian woman. The rebuilding of the bridge becomes a melancholy metaphor for reconnecting the two lovers, Cambodia to Japan, and the brutal past to the hopeful present.